Our watchword has been “We go anywhere we’re called! We make the people of the world feel alive!” And for us, our trip to Cyprus, the 54th country we have visited, was an unforgettable one. The evening of 27 June 2017 we departed our home base in the village of Asuka, Nara prefecture. Continuing with our half-year run of performance, which we call a world tour, for us the scene of departing Asuka for a foreign land was a familiar sight. But this time was somehow different. Leaving for Pafos, Cyprus, we felt a different sensation from usual. It’s hard to explain, but what we felt may have been something like – how to put it? – a sense of mission. Each and every one of us seemed somehow to be keyed up, our faces set for a challenge. We even seemed to be sharper dressers than usual. We had an invitation to European Capital of Culture Pafos 2017 and we were going there to perform. I think we all saw this as an expression of faith in us and an appreciation of our track record. Not that anyone actually said as much, but we proudly boarded the flight with outrageous notions of “a duty to serve as a bridge between the peoples of Japan and Europe” and self-said bearers of the heavy responsibility of bringing it off. Having left Asuka behind us, it was around 30 hours before we landed in Cyprus after changing planes. We arrived in Cyprus the afternoon of 28 June 2017. What greeted us directly we exited our plane, blanketed completely in fatigue, and stepped out into Cyprus were the clear sky and sun of that island. The sudden direct sunlight dazzled us. In June, Japan was in the midst of the rainy season we call tsuyu. We had left behind an Asuka damp and hazy with rain, and the Mediterranean island of Cyprus, where we arrived by plane late at night, was without exaggeration shimmering all over with radiance. It was dazzling. The sky was blue and the sea was bluer. The sun was powerful, and the fresh breeze seemed to pass cleanly through us, mind and body alike. Of a sudden we thrilled to the warm welcome. 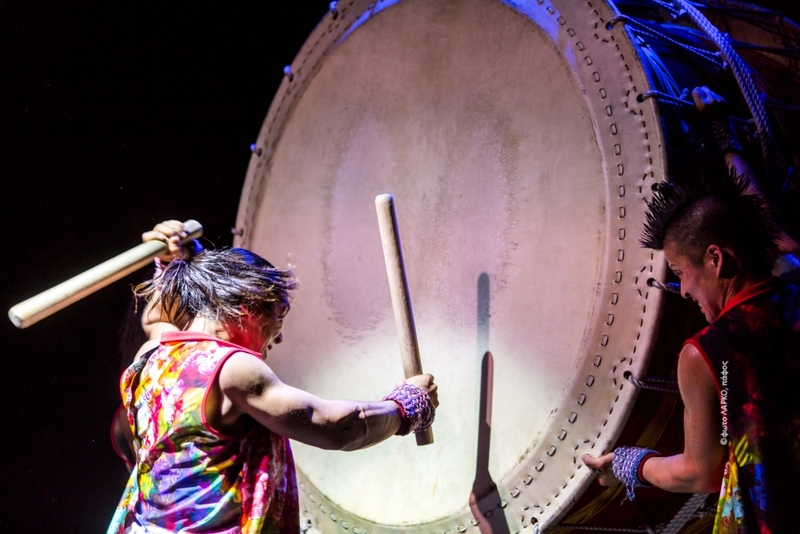 Employing the traditional instruments of Japanese drumming, our group Yamato sets itself the challenge of creating radical, innovative performances. 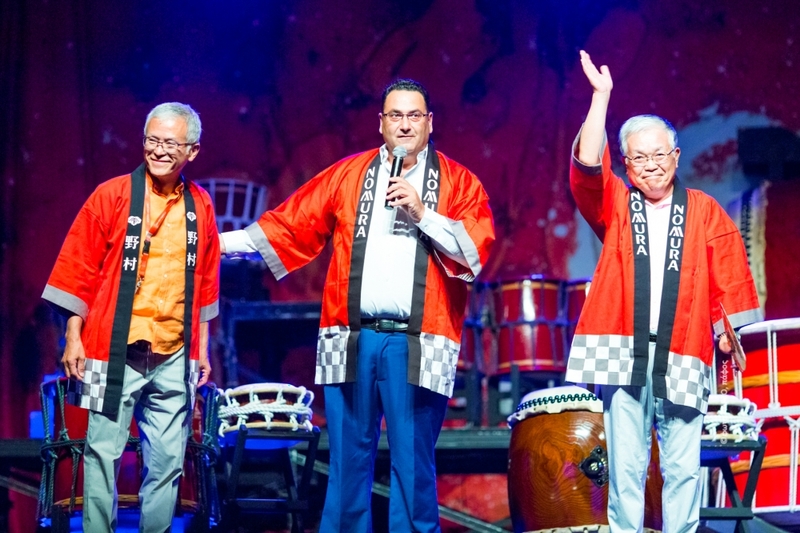 We make our homes in Asuka – birthplace of the Japanese state, steeped in history – and we use traditional instruments, but there is nothing traditional about our music or our performances. 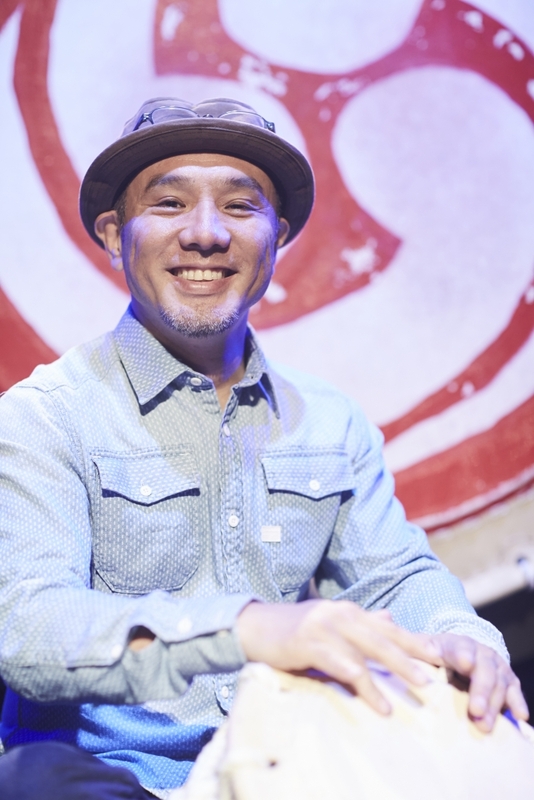 Living in the now, we work body and soul to create a new world of music with the instruments of Japanese drumming. Based in the village of Asuka, we travel the world and meet people from all over. Our performances are sometimes called ones of “flesh and music”. The explosion of drumming that we produce with our complete physical and spiritual beings, our performances pushing the human heartbeat and endurance to their limits are microcosms of the lives of all people. With the reverberation of the drumming and our trained physiques we give expression to the energy in human beings. We deliver energy to our audience. Receiving our energy, the audience returns energy to us through smiles and cheering. In this repeated exchange of energy, together we bring to maturation the product called Life. And now the 2017 European Capital of Culture. Pafos, called the birthplace of beauty. This is where Yamato is to perform now. Under a scorching sun the Yamato stage comes together in front of city hall. One by one the drums make their appearance from a great trailer laden with a 40-foot container. First the giant drum 170 centimeters in diameter and weighing over 500 kilograms, and then several tens of the small and medium-sized Japanese drums. The giant drum formed from a giant tree 400 years old strikes a pose against the blue sky. The day of our performance, setup began in the morning and went on and on. We dripped with sweat and fried in the sun. We would perform but once here in this faraway land. The time passed in concentration so that we could give it everything we had gained from our previous 3,500-plus performances. The deep blue sky turned orange, and the wind cooled. The beautiful stage rose up as though synchronized with the beauty of the sky. The band members, the crew from Japan, the crew from other European countries, and the crew from Cyprus all worked together to build the stage. The work went on till dawn at four o’clock. We catnapped a few hours, and then it was the day of our performance. That morning a fog rose from over the sea. Silent and stately, the fog, which the locals too said was unusual, stole over the land and wrapped the city of Pafos inside itself. The tension thickened, foreboding a special day to come. We started in again on the setup work in front of city hall where we would perform. Instrument checks, sound checks: we carried on with the details of our work. Noon came and went, and just as we were getting a bit impatient a throng had gathered in front of city hall. That’s right, we were giving a drumming workshop before the performance. We hastened to finish setup and started on the workshop. Soon enough participants had packed the stage. No one had seen a Japanese drum before, and intense curiosity showed on every face. And then we sounded all the drums at once. The explosive sound of Japanese drums resounded through the skies of Pafos. Everyone wore a wonderful smile. Sweat glistened. Everyone nodded kindly at our Japanese-mixed explanations. I hoped only that we were able to communicate, even if only in small measure, the joy we take in drumming. 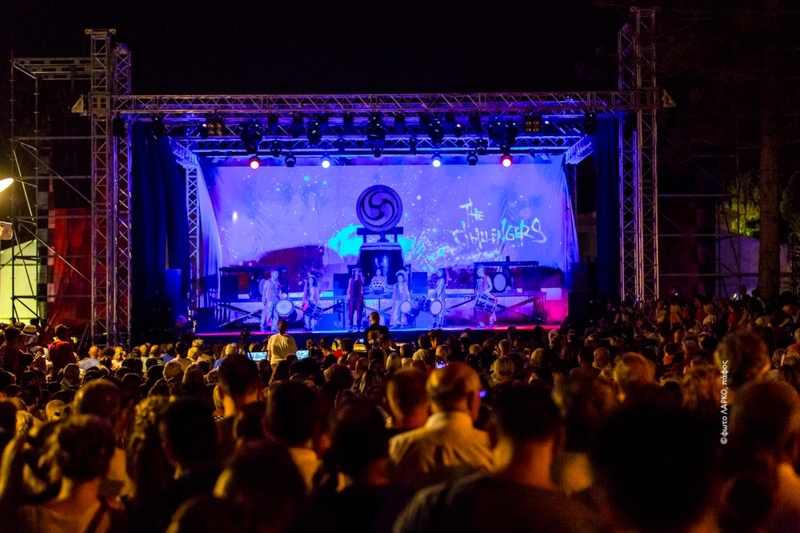 The Yamato stage was now finished and ready in the darkening city of Pafos, and atop the stage that so many different people had worked together to build stood the drums. The seats began to fill. They came from all over. People said with smiling faces they’d come from the other side of the island in order to see Yamato. Grandpas and grandmas, fathers and mothers, their firstborn sons and daughters, small children and even tiny little babies. Everyone was there. Nine p.m., our start time. People, people, people. More than anyone could count. To them all we announced the start of the show with a strong beat. Everybody walks their own path through life, and we prayed that we might help them along theirs with even just a small amount of energy. The beautiful Cypriot city of Pafos. In 2017 all sorts of art from all over the world is coming to this island to decorate the land, bringing stimulus and dynamism to the people. In this world of unceasing conflict here is a moment different people can become one. This city Pafos is full of possibilities for the birth of new understandings, new relationships. It is not politics that brings people together, nor sport, but culture and the arts. My heartfelt wish is that this experiment called the European Capital of Culture retains people’s support and lasts forever. In the end it was the beautiful sea and sky, the scenery sparkling in the sunshine, the wind blowing through it, the delicious food, and above all the smiling faces of the people of the island. Yamato has benefited from the effort and work of many people. Thank you truly. The sound of Yamato drumming will live on, reverberating in the pulsation of everyone’s lives, and again today it is giving courage to somebody somewhere.